Easter is a major part of the Tobagonian calendar. 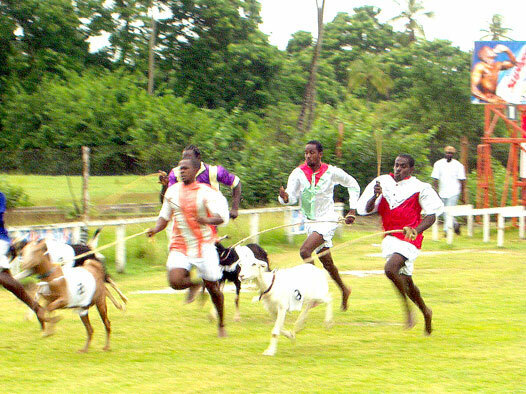 There are the annual Goat and Crab races and it is a period in which people have time to ‘lime’. The act of ‘liming’ is to get together with friends (known as ‘limers’ or, as a group, ‘the lime’) and eat, drink and talk and have a good time. And what better place to go than down by the river where the food of choice is curry, curried duck, curried goat and, a real Tobago favourite, Curry Crab and all eaten with dumplings! Green seasonings, such as thyme, celery, parsley, chive, flavour pepper. First kill, wash and scrub the crabs. Or get someone to do it for you as it is not a pleasant operation! Crack the big claw (known as the ‘Gundi’) especially if it is large. Blend the green seasonings with a little water, and pour over the crabs. Burn the garlic in hot oil. Blend the curry powder with a little water to form a paste and add this to the garlic oil. Add the seasoned crab and steam for 15 minutes, turning frequently. Add the coconut milk and continue to cook and stir to make sure that any bits that stick out of the sauce don’t miss out on the cooking and flavouring!